When hackers attempt to gain unauthorized access to a computer or server on the Internet, one of the first things they do is look for open ports. One method of searching for open ports is TCP SYN scanning, but this can be tedious. NMAP is a free and open source port scanner that hackers can use to automate the process of finding open ports to attack. NMAP uses IP packets in a nonstandard way to scan for computers and servers on the Internet and search for open ports, services available at those ports, and other information that can be used to hack the system. 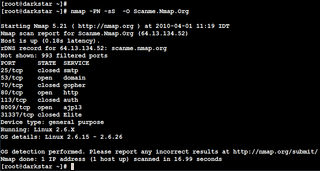 NMAP is available for the Windows, Linux, and Mac operating systems. NMAP has a command-line interface but utilities with GUI's are available that work with NMAP, such as the Zenmap results viewer. PortSentry is a Cisco security tool that monitors for both TCP as well as UDP scans and can detect stealth scans such as those produced by NMAP. PortSentry can be configured to listen on ports and detect scan attempts and can automatically firewall the scanner's IP address. NMAP is promoted as a "Security Scanner", and since it's free and open source, it could indeed be used for security auditing by scanning your own network to see what ports are available to hackers.